Total War Battles: KINGDOM APK is coming with the new version 1.30. Inside the latest game from developer Creative Assembly, players will create an empire. All arranged by his players, such as the economy in the kingdom, army, castle, population, and many more. The players are required to increase population in the kingdom, because if you have more population in the kingdom, you will get greater power for your kingdom. Total War Battles: Kingdom will use the background history of England in the early 10th century. As we know that at that time the kingdom in Europe was entering Dark Ages. Players will play into a child of nobleman given territory. After that, he will certainly create forces. If we compare it with the Total War Battles: Shogun, this game has wider game mechanics. The preceding series only invites players to battle with the battle system in turn. 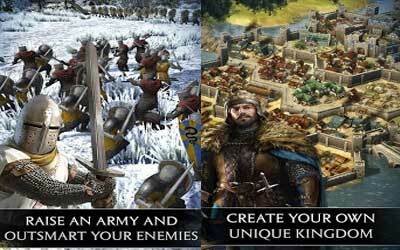 Kingdom invites players to build castles and prepare the best troops that will be faced with the opposing forces. Gameplay Real Time Strategy strongly supports the concept of this game. In addition to regulating the purposes of the kingdom, such as the economy and population are of course the main objective to fight against other kingdoms. You will fight with other players from around the world directly. This game can be played anywhere and any device. Yes, this game will be cross-platform game which means you can fight with players on Android, iOS, Mac, or PC. And the other good thing the data will be stored in the cloud that has been provided. So anytime and anywhere you can continue your game. Build and expand your Kingdom, with farms, quarries, blacksmiths and more. Alter the land by creating rivers, lakes and mountains. Command your army in large-scale battles. Battle other players in real-time. Cross-Platform – Play on Phones, Tablet, and PC, whenever you want, wherever you want. Actions in your Kingdom will carry over onto any device you play on. From the creators of the award-winning Total War™ games. Good graphics, fun castle building and also amazing battles! I would suggest the introduction of hero units to battles as well who give either an aura to inspire troops or an ability to make the unit fearsome in battle.